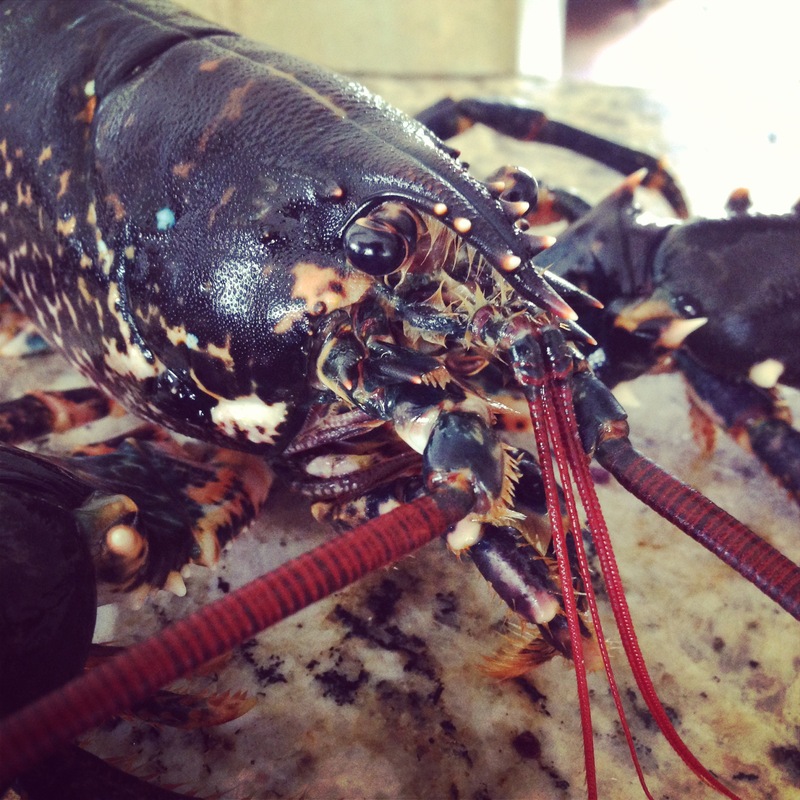 I think I can honestly say that I’ve held a genuine obsession for lobsters for the whole of my life. I first handled a live one, probably aged about 5, hunted for them at low-tide with my Father (at not a lot older), and constructed my first homemade pot a few years later, having been shown how to use a netting needle by dear old Dougie. And here I am, forty-odd years adrift from my first ever catch and still relishing the memory and excitement of that wonderful sense of anticipation, of the contents held, by the weedy and barnacled creel that approaches the surface, the saturated and slippery rope spooling onto the boards of my dinghy as I haul away. The moment of truth, the opening of the door, the discarding of the bycatch: shore crabs, hermits, starfish, a blenny. Old bait removed, a fresh plaice-frame is doubled over and secured on the string. Door closed and the pot rests briefly on the stern before returning to the sea bed, accompanied by the clattering of the cork line, as it pays back out and the splash of the dahn as it remarks the target. A sea of glass, the July sun-sparkle shimmering radiantly away to the East’ard horizon. The gentle slop and lap as I pull back towards the shore, oar leathers creaking rhythmically in the rowlocks. Betwixt my bare feet crawls a creature of indescribable beauty- my prize and my possession. My Lobster. Ok reverie over. It’s time to talk recipes. Obviously, I’ll take my lobster any which way it comes; boiled, grilled, sautéed, baked or bisqued it’s hard to define which method is preferable. A simple salad, adorned with pasta, a l’Americaine or just in a crusty roll, I adore all, but this weekend with a delivery of Dreckly beauties gracing my kitchen, I decided on an old mainstay. 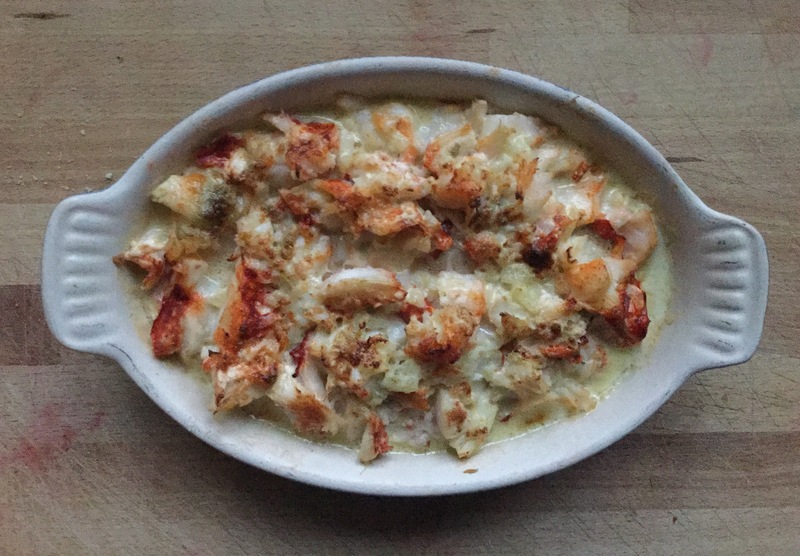 So, armed with all the accoutrements needed for a Friday night seafood extravaganza, I produced this version of an “Open” Thermidor of Lobster i.e. In this case without the shell, (OH not really being a fan of it- or fish bones either). Just as sublime in taste and texture -just without the aesthetics of the natural receptacle. I love to cook a live lobster. There’s something about the process that is reverent and symbolises to me the true concept of wild food that has been caught in a wholly natural way. However, I appreciate that most will receive their fish pre-cooked and with this in mind I shall start at the dressing stage. 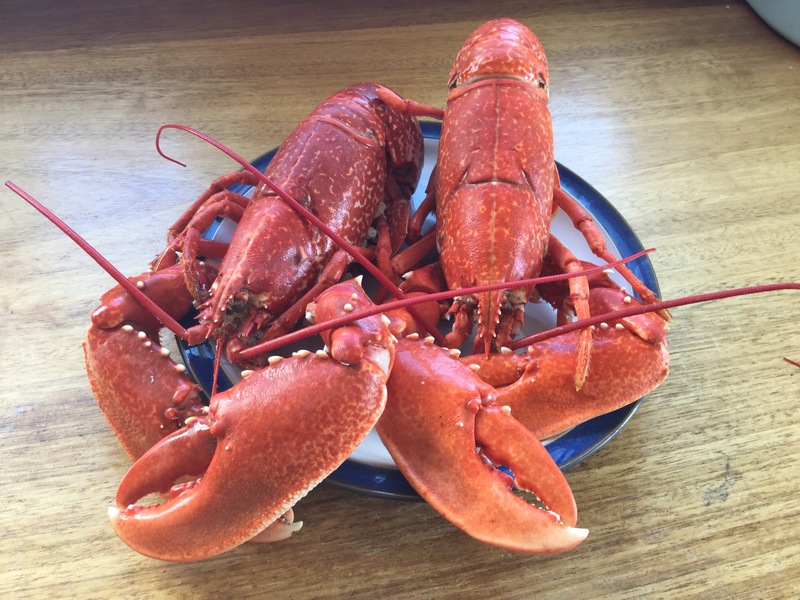 Although I would make the note that, if possible, all shellfish should be cooked in seawater for maximum effect. 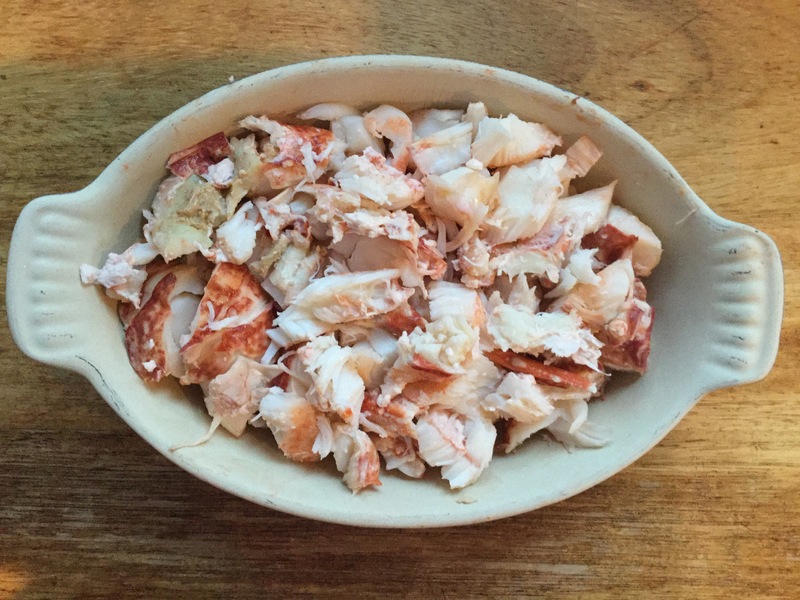 All I use for dressing out a lobster or crab is a heavy cook’s knife and my treasured pick. Other tools will suffice, but really, that’s all you need. Having removed all legs and claws from the body, I then disengage the tails in a gentle twisting action. These can then be “peeled”, as I remove the meat whole by squeezing the tail, face up, in one hand longitudinally, until an audible crack is heard. Once cracked along the length then the shell can be stripped back and the flesh removed in one entire piece. This in then split in half with the knife along its length and the intestinal tract removed. I then return to the head and split that too and set aside the liver (or tomalley) for use in the sauce. The head too contains meat under the carapace, which needs to be winkled out of the cavities with the pick and probably eaten on the spot! 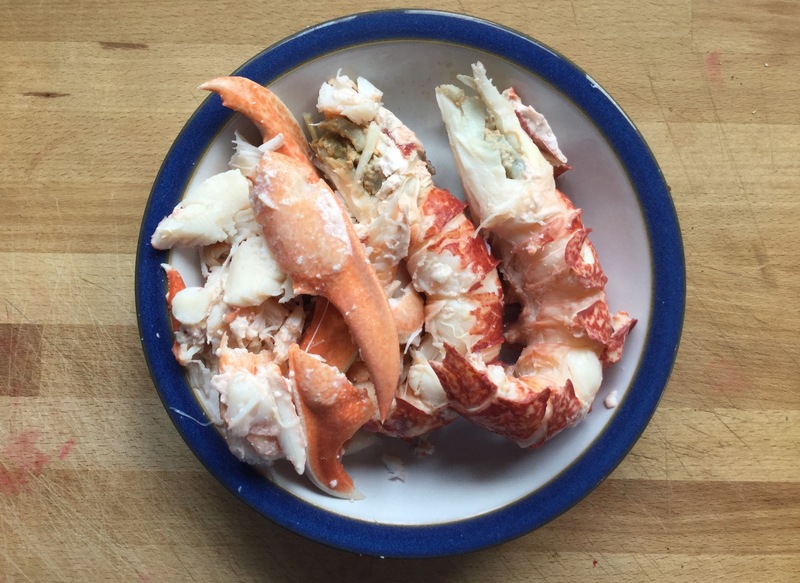 Claws, I separate down into sections, part at the joints and crack with the back of the knife to reveal the meat. Legs too can yield, depending on the size of the fish, but I generally put in the stock, or exert my cook’s prerogative of sucking the meat out of each one, aided by a squeeze of the teeth. Having removed any unwanted parts then for the cooking, I slice all the meat up into bite size chunks and put into a heavy iron, ceramic or earthenware dish and set aside. A pinch of freshly chopped Tarragon. A good sprinkling of freshly grated Parmesan. Sweat the onion/shallots off in the butter, in a saucepan taking care not to caramelise. After a few mins, then add in the stock, vermouth and half of your cream and bring to the boil, cooking further until all is reduced by half. Add in the remaining cream and leave to simmer. Stir then until the sauce feels thick enough and doesn’t run off the spoon easily. 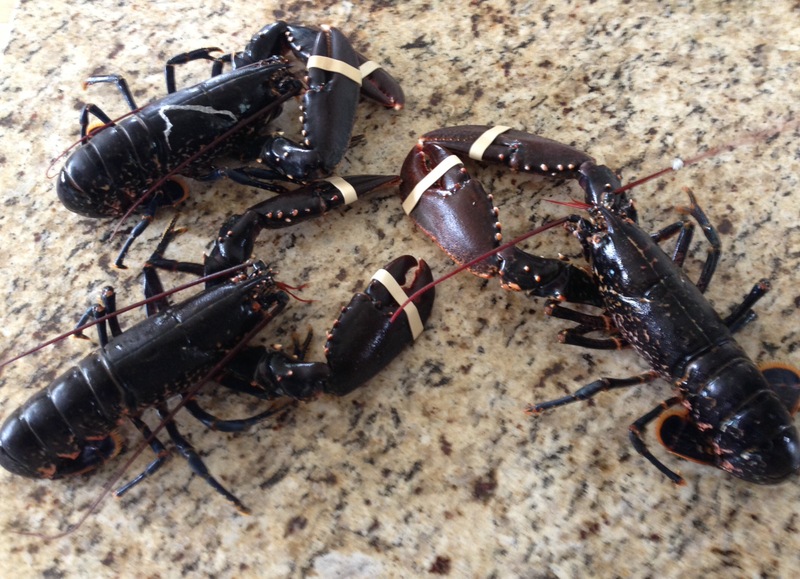 Then you can add in the mustard, the tarragon, the tomalley from the lobsters’ heads, whisk all together and season as necessary. Serve how you wish. This time I accompanied it with some freshly-dug and sautéed Maris Bard and a green salad. French bread also serves equally well. A massively flavoursome and entirely satisfying supper. One day, I shall again, fish my own Lobster Pots. A lovely recipe. Read it yesterday and it still lingers in my mind, making me salivate. Ha ha. You win 1st prize for spotting the deliberate error! That was a pic of 3 live fish from last year! Just wanted to illustrate them. Only 2 at the weekend- both absolutely wonderful condition. Spiders were great too!